Having outdoor lighting provides you with more opportunities to enjoy your outdoor spaces throughout the year. Outdoor lights also give your yard and home better security and can improve the overall appearance of your property. 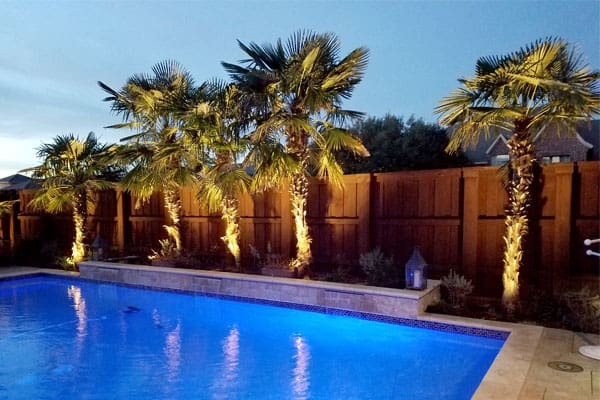 When you’re looking for the best outdoor lighting in Burleson, Texas, the lighting professionals at Creative Nightscapes can help. We offer LED lighting, garden lighting, security lighting, and more that can make your home and yard look even more beautiful. With improved security and aesthetic value, you and your family can get even more enjoyment out of your outdoor space all year round. Creative Nightscapes provides Burleson homeowners with outstanding outdoor lighting for landscapes, patios, gardens, pools, and home exteriors. Whether your pool needs added lighting for nighttime swimming or your outdoor walkways need more lighting for safety purposes, our lighting professionals have the knowledge and skills to create the ideal outdoor lighting design for your property. Please contact us today to get a free quote for the best outdoor lighting in Burleson. Our lighting team looks forward to helping you with all of your outdoor lighting needs. Landscape lighting provides a number of benefits for your yard, but it’s important to make sure that it’s installed correctly. You’ll also need to ensure that you have a landscape lighting design that fits your property. 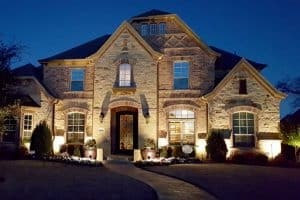 At Creative Nightscapes, we offer reliable landscape lighting installation and design in Burleson. Our team of lighting professionals can evaluate your landscape and come up with the ideal design to suit it. This design considers several factors, such as the kinds of landscape features your property has. 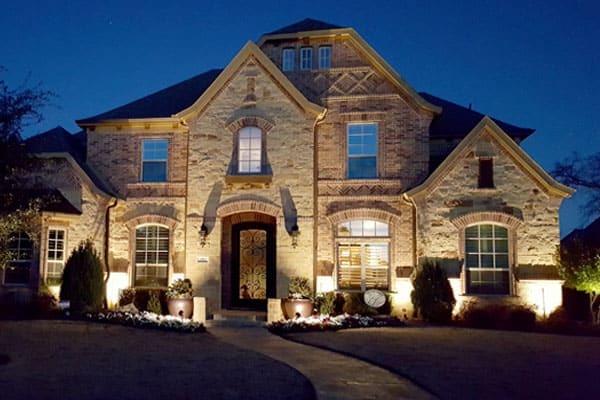 When it comes to installation for your Burleson home, you can depend on our lighting experts to carefully place your landscape lighting in the right spots for optimal effect. With more than 14 years of experience in landscape lighting installation and design, our professionals have the skills and equipment needed to do an excellent job. We’ll work with you on creating the right landscape lighting design for your property, then take care of the installation process as quickly as we can. Get in touch with us today to get a free quote for landscape lighting installation and design in Burleson so we can get started. The cost of living index for Burleson is 99, which is roughly the same as the national cost of living index and slightly higher than the index in Texas. The average household income is $69,000, which is considerably higher than the state and national average household income amounts of $53,000 and $52,000, respectively. The median home price in Burleson is $126,300, which is slightly lower than the median home price of $131,000 in Texas and significantly lower than the median home price of $175,000 in the U.S.
Around 40,000 people call Burleson home. The city offers low crime rates, convenient local amenities, good education and great weather, as well as quick access to nearby Dallas and Fort Worth. Burleson residents can get involved in their local community in a number of ways. Volunteer opportunities include administrative services, environmental services, parks and recreation, library services, and animal services. Residents can also volunteer with the police department, senior center, visitors center, and Hidden Creek Golf Course. Those who live in Burleson can take I-35W N and I-30E to reach downtown Dallas in about 45 minutes, depending on current traffic. Fort Worth is even closer. Residents in Burleson can take I-35W N to get to Fort Worth in just under 20 minutes. This provides residents with convenient access to all of the attractions and amenities that Dallas and Fort Worth offer, as well as employment opportunities. Burleson offers several things to do and places to see. Residents can visit Pirates Cove Fun Zone to enjoy water slides and other water attractions all year round. North Texas Jellystone Park, located next to Pirates Cove, offers fishing, paintball, and more. Those who want to play a round of golf can head to Hidden Creek Golf Course. The course offers golfers of all levels a chance to put their skills to the test. After playing a round, golfers can have a bite to eat at Terrace Bar and Grill. Burleson residents who like spending time outdoors can visit Bailey Lake Park for fishing and scenic walks along the park’s fitness trails. Wakefield Heights Park offers a playground for kids to enjoy. Residents who appreciate wine can take a tour of Lost Oak Winery and attend local events here. The winery also features a wine shop filled with a wide range of red wine, white wine, sweet wine, dessert wine, and more. Those who enjoy sporting events can visit Chisenhall Fields to watch local teams play. This sports complex also includes a picnic area, playground, and walking trails. Installed Kichler LED landscape lighting at home in Meadow Creek Lane Addition. Placed up lights in front of home to accent facade and entry way column. Installed Kichler LED outdoor lighting at home in Willow Creek Ranch. Set path lights to accent landscape greenery and illuminate walkway. Placed up lights to accent Palm trees, Crepe Myrtle tree, and small shrubs. Installed Driveway Markers with Kichler LED bulbs at home in The Retreat to illuminate the edge of driveway. Performed quarterly maintenance for a residential client in Willow Creek Ranch; cleaned and tested all Garden Light fixtures, replaced three halogen bulbs. Performed semi-annual maintenance for a residential client in Shadow Run Estates; cleaned and serviced all Garden Light fixtures, replaced six halogen bulbs with LED.